Traditional science and technologies are crucial to the everyday life of a large part of India. But will the traditions hold on? about three decades ago, Nuka Raja, a farmer of Bhimavaram village in east Godavari district of Andhra Pradesh, used to sow only traditional crops. The crop yield was low, but sufficient. In the 1980s, a tobacco company persuaded him to switch to tobacco, promising fertilisers, pesticides and a loan. Many other villagers also shifted from traditional crops to commercial crops. Soon, they lost their native seeds, which was only one of the problems. "Commercial crops have given us only diseases," says Surya Babu of Tungamadagulu village of the same district. But these villagers, unlike others, were smart enough to realise the value of traditions. They reverted to age-old practices. "Earlier, we used to have around 26 crop varieties in our region," says Raja. With the help of a local organisation, they recovered six seed varieties. Now, they maintain their own seed banks and encourage others to do the same. "We give seeds to only those who are sincere. In turn, they have to follow our local exchange system," says Babu. Raja and Babu are not exceptions. They represent an emerging trend: India's rural technologies have a chance of survival -- though faint -- despite the charging juggernaut of industry. People who are excavating the past for solutions to present problems are not restricted to agriculture. They can also be noticed in the sectors of health and industry. These people are using traditional systems of knowledge on a modest scale in the face of tremendous obstacles. The presence of these systems across the country reflects their life-supporting social roles for millions untouched by modern science. There was clear evidence of this -- and more -- at the Third Congress on Traditional Sciences and Technologies of India held in Varanasi, Uttar Pradesh, from October 28 to November 2. The congress gave a scientific look to traditional sciences. It was organised by the Patriotic and People-Oriented Science and Technology Foundation ( ppst ), Delhi, and the Gandhian Institute of Studies ( gis ), Varanasi. 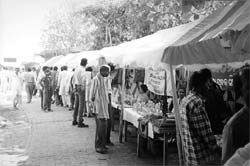 The congress was attended by a large number of artisans, peasants and intellectuals from all over the country. Over 300 papers dealing with thirteen subjects were presented. Tradition is nothing but indigenous knowledge and practice special to a particular society and civilisation. However, there is a general misconception that traditional knowledge is outdated. It is considered incompatible with modern systems. Tradition, here, is seen as retrograde, because it harbours much that seems harmful in the modern context. It is set in opposition to modernity and is considered incompatible with modern science. Agriculture, industry and health There are numerous examples of traditional science continuing to serve life-supporting functions in everyday life of the masses. Farmers are turning back to organic cultivation, having burnt their fingers with modern agricultural methods. D Bharamgoudra is a farmer from Karnataka. Much against his father's wishes, he switched from organic farming to chemical farming three decades ago. "In the beginning, we got good yields. But gradually, not only did the yield come down but various diseases and pests crippled my crop," he says.A thought-provoking paper highlighted how agriculture in India came to grief during the Green Revolution and the subsequent import of modern technological packages which had been formulated under different ecological and socio-economic conditions. "Although the Green Revolution provided food security and solved the problem of foodgrain in deficit areas, the economic and ecological costs of these technologies became difficult to sustain," says H S Shankar, who is with the department of engineering, Indian Institute of Technology ( iit ), Mumbai. Dharampal, eminent historian and author of Indian Science and Technology in the 18th Century , points out that most of the agronomic practices of Green Revolution proved to be seriously unfit for the heterogeneous characteristics of India's ecology and economy. In a majority of cases, new varieties of wheat, rice and other cereals surpass local varieties when managed with traditional practices. It has been realised that traditional farming and cropping systems were not products of ignorance but stemmed from ecological rationale. Shankar discussed the ill-effects of chemicals and fertilisers commonly used in the farming sector, which have spoiled the soil's health. The farmers are forced to use costly inputs, he observes. The solution, he notes, lies in the traditional system of organic farming for which the necessary resource materials, which are cheaper and environmentally-friendly, are abundantly available in and around the farm-sects. Since time immemorial Indian farmers have been following the concept of managing pests and diseases through local technology, Shankar emphasised. P Narayanaswamy of Annamalai University, Chidambaram, presented a paper on the various traditional practices of pest control which were in high use in early periods in Tamil Nadu for possible use as an alternative to chemical pesticides. Nearly 1,000 such practices were compiled and documented crop-wise and pest-wise. Papers presented in the industry sessions point out that India has neglected the science of the common people in the name of industrialisation. In the section devoted to the Indian health care systems, a paper by P M Unnikrishnan of Bangalore argued that Ayurveda and the other Indian medical systems are treasure houses of ideas and perspectives in the emerging scenario of the complex challenges of health. There is, for example, Ayurvedic ophthalmology, treatment of jaundice by medicinal plants and time-tested cures from nature, pointed out Anuradha Singh of the National Institute of Science, Technology and Development Studies ( nistads ), New Delhi. Traditional cures are being patented increasingly by transnationals, involving neem , turmeric and isabgol , among others. "This is because these traditional cures are finding wider acceptance. But the government is doing precious little to save these traditions, says Ashis Nandy of the Centre for Developing studies, New Delhi. However, indigenous systems of medicine have not been able to make as strong an impact as the modern health system. "The people who are working on local traditions have to strengthen the belief of the local people," says Anuradha Singh, who coordinated the health section in the congress. A team of professors from the Agricultural College in Bapatla, Andhra Pradesh, make a case for the comprehensive compilation of indigenous knowledge in agriculture and health care. Documenting local knowledge can go a long way in providing solutions to many problems and also help preserve traditional technology, says Yogesh Ghokle of the Centre for Ecology Studies at the Indian Institute of Science ( iis ), Bangalore. The centre is documenting systems of traditional knowledge. "We are publishing about 60 registers from different parts of the country to document the rich biodiversity that exists in the country. We want to document this knowledge or else these treasures will be lost forever," says Ghokle. India's scientific traditions are as old as its civilisation, and all of it has not been lost to the moder onslaught. Speaking to Down To Earth , Dharampal said: "History suggests that around 1750, about 73 per cent of the world' s industrial production came from India and China. And even in 1820, they were producing about 60 per cent of the world's industrial production." "We have to realise that Lok Vidya (knowledge of the people) is still present in a large number of people in India," says Vijay Cheriar of pspt . Traditional sciences bear a closer relationship with those values, ideas and philosophies, he observes. "To understand traditional sciences and technologies is to understand people, whether in India or anywhere in the world," says Nandy. But why have these traditions declined in India? Dharampal says the biggest blow came to these sciences after India's independence. With increasing emphasis on modern sciences, these traditions were relegated to the back seat. Most of the delegates at the congress knew the problems facing traditional sciences, but had no solution to offer. "Villagers are looking at the cities and are adopting 'alien' technology. We need to educate them," says V Ramchandran of Vivekananda Vikas Kendra in Calcutta, West Bengal. But Sunil Sahasrabudhey of gis disagrees. "We should stop disorganising these people. Let them find their own solutions," he argues. K Karunakaran, vice-chancellor of the Mahatma Gandhi Chitrakoot Gramodaya Vishwavidyalaya in Satna, Madhya Pradesh, points out it is important to strengthen the belief of the people, as they are confused in today's competitive world. "Often we talk about intellectual curiosity when we talk about the rural science. We are not really pushing the issue. We need social entrepreneurship rather than dollar entrepreneurship," he adds. Nandy notes that the people have knowledge and require only a platform to raise their issues. "If they do not get proper incentives, they will collapse," says Dharampal.